When plastic cutlery was first introduced, it’s unlikely anyone realized how prevalent it would become, or how damaging to the environment. In India, the enormous waste from single-use utensils prompted one inventor to create an edible alternative that breaks down in record time (if not eaten with the meal). Narayana Peesapaty, founder of Bakeys, has already sold 1.5 million spoons made from made of millet, rice and wheat, and now he’s launched a crowdfunding campaign on Kickstarter to expand the brand worldwide. The effort has already raised more than four times the original $20,000 goal, with more than two weeks left. Many companies have worked to develop more eco-friendly alternatives to plastic utensils. Now, diners can choose to cart around their own stainless steel or bamboo travel cutlery, cutting out the need for disposables. They can also choose to use biodegradable, edible utensils from potatoes or corn. But even those haven’t taken off, because they are costly and still take essentially forever to break down in landfills. What the world needed was an eco-friendly alternative to the plastic spoon that wasn’t just a little bit better, but changed the game entirely. Enter Bakeys edible spoons. Peesapaty felt that plastic cutlery wasn’t doing its job and, combined with the knowledge that India’s diners throw away some 120 billion plastic utensils each year, was inspired to create a different type of single use spoon. Bakeys utensils are made to last up to 20 minutes in hot liquids (think soup, mmmm) and they are flavored with some of India’s favorite spices: ginger-cinnamon, ginger-garlic, cumin, celery, black pepper, mint-ginger, and carrot-beet. There is also a sugar option for those less interest in adding an herbal flair to their meal. Bakeys also makes an unflavored spoon for commercial clients, and the utensils have a shelf life of two to three years. Although the spoons aren’t gluten-free, because they contain wheat flour, they are free from genetically modified organisms (GMOs) and completely vegan. Funds raised through the Kickstarter effort will go toward expanding operations and increasing production. The company has a facility in the works that aims to churn out 800,000 edible spoons each day, and they plan to expand to other utensils within a few months. After nine days of the crowdfunding campaign, Bakeys had already tripled the original goal, and with two-and-a-half weeks remaining, backers have so far pledged nearly $89,000. To say Peesapaty and his team are overwhelmed with the response so far would be a giant understatement. Because the company is already manufacturing the spoons for sale in India, rewards are promised almost as soon as the campaign ends. A pledge of just $10 will reap a reward of 100 edible spoons in the flavor of your choice. 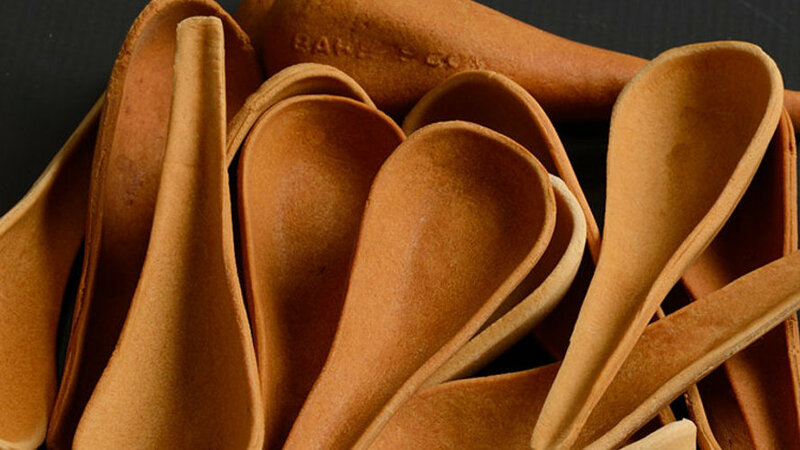 Bakeys edible spoons are a great alternative for home use, but what the company is really after is large commercial customers, so the tasty food-delivery vehicles can really make a dent in the plastic waste from single use cutlery. Actually, these are utensils but rather only spoons. Where are the knives and forks? I am sure that this design is to brutal to be used as anything other than a spoon and, as the article points out, there are other eco-friendly designs which can be used on all types of cutlery, not just spoons. 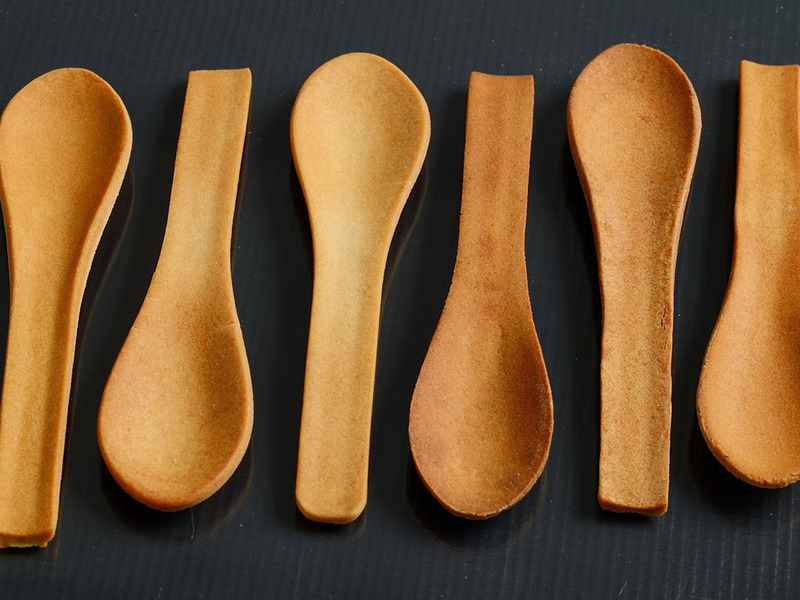 India-based Bakeys makes edible spoons in an attempt to cut back on plastic waste. Bakeys' Kickstarter campaign has already raised more than four times its original goal.